Ameda Egnall Elite - hospital grade double electric breast pump. A personal Hygienikit is needed for the pump to work. These kits are $51.45. There is an optional delivery fee of $25.00 per pump in the Savannah area. Purely Yours Breast Pump with Backpack - Purely Yours Pump, dual HygieniKit, microfiber backpack tote with exclusive detailing, AC power adapter, car adapter, (2) cotton breast pads, milk storage guide magnet, manual pump adapter handle and Cool 'N Carry Tote with (3) cooling elements and (6) 4 - ounce bottles with tops. Purely Yours Breast Pump with Carry All - Purely Yours Pump, dual Hygienikit, microfiber Carry All tote with exclusive Ameda detailing, AC power adapter, milk storage guide magnet, and Cool 'N Carry Tote with (3) cooling elements and (6) 4 - ounce bottles with tops. A Cool ' N Carry - tote is included in the Backpack and Carry All version above. An easy simple and fast way to store, freeze and serve breast milk. Pump directly into the Pumpmate freezer bag using disposable bottles that fits all makes of breast pumps. This is the perfect compliment for all breast pumps saving time and effort in storing and serving breast milk. Bags have convenient easy pour spouts to prevent wastage. 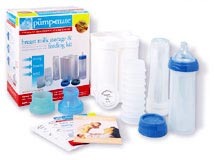 A double Pumpmate Starter Kit for $39.99 is all you need to get going. 20 per box available in 4or 8 oz sizes. Price: $6.99 per box of 20. $6.99 per box of 20.